Hiking with my boys is my favorite past time. It is a time where we can disconnect and be free of distractions. We can explore and investigate. They find working together benefits the individual as well as the group. And most importantly to me it's where they tend to open up and communicate with each other and with me the most. 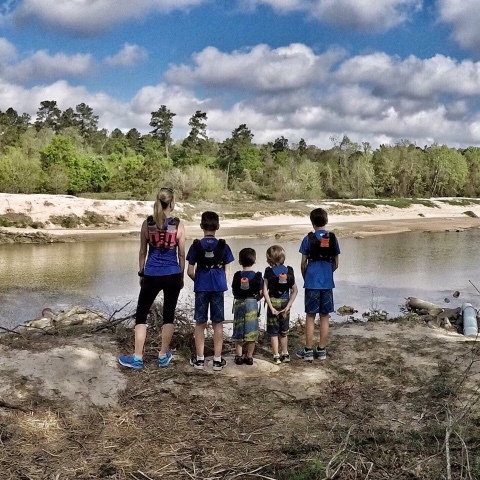 A lot of parents ask me for advice about family hiking. Many have said their children whine or complain along the way. They're hot, they're tired, they're hungry or thirsty, etc. 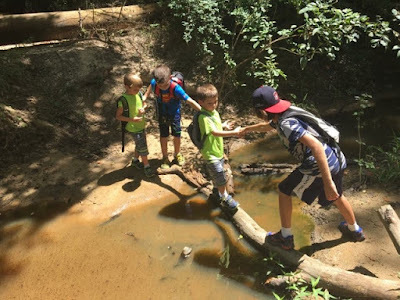 I have learned some tips that help make the most of our outings and keep hiking fun for all. 1. Know their limits. You may need to keep it short initially especially if they are young. You can increase the distance each time you get out there or as they get older. 2. Dress properly and comfortably. Be sure to dress for the weather. Don't wear nice clothes - let them get dirty! I choose bright, matching colors so they are easier to spot! And make sure they are wearing good comfy shoes. 3. Give them a responsibility. And this could vary for age. You can give them a job such as guide or lookout, Let them be the leader. If they are older let them carry a hiking tool such as a compass or multi tool. You can let them bring a camera to be the photographer or reporter. 4. Let them choose the path. Give them a little freedom in choosing whether to turn left, or right, or go straight. This may take some planning ahead of time if it's a trail you are unfamiliar with, but it is worth it! For an added bonus let them carry a trail map. 5. Have them carry their own water. 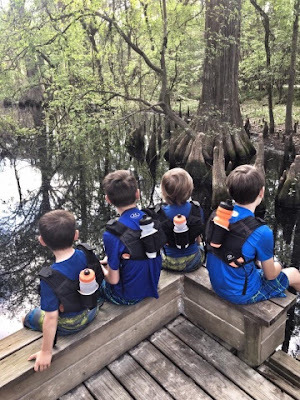 Our boys have their own hydration pack, They each have an Orange Mud Hydraquiver Single Barrel pack. It's great because they can carry their own hydration and it has pockets as well. They carry bandaids, tissues, their own hiking tools, a whistle, etc. 6. Take breaks. Take time to stop and smell the roses. Take it all in. Listen to their cues. If they are tired find a great place for a break or even cut it short if you need to. You want to nurture a love for hiking and being outdoors. 7. Have a picnic. We almost always bring food and stop halfway thru to eat. It provides them the opportunity to rest and refuel. And we always let them pick the spot which gives them freedom and helps them feel like they are contributing. Plus it makes them work together to agree on a spot. 8. Go on a leaf hunt. See how many different color leaves you can find. Collect leaves for leaf rubbing. Match which leaf goes with which tree. Identify types of leaves/trees. 9. Geo Caching - At geocaching.com or using the geocaching app you can learn everything you need to know about geocaching. It 's a fun treasure hunt and you'll find hidden treasures all over the place. You use coordinates to navigate to its location. You can find the treasure and leave it or take it and replace it with one of your own treasures for the next person to find. This can be a lot of fun! 10. Keep it simple! Teach a love and respect for nature. A great app I've found that we use is All Trails. You can explore trails near you or enter a city, park, or trail name for maps. Users also post pics and reviews which I find helpful. You can find National Parks at www.nps.gov. Your state also has a website for state parks. Chances are your county does as well. These are all such great tips! Even though I don't have kids I will still use these for hiking with friends who are new to hiking. Such great advice! Love that y'all share the love for the outdoors! 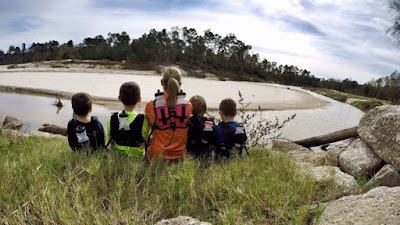 Useful tips are sharing about hiking. All information is really valuable and informative. Hiking is an enjoyable riding or dangerous riding. Recently I go on a hiking trip. This post is impressive and useful. Thanks for sharing. They offered in to the allurement and started keeping track of who's winning in their recreations and this prompted a wide range of shades of malice - rivalry, desire for winning, swindling, outrage and battles. They lost the straightforward delight of play. One of the challenges that we face is how to keep the kids entertained and content. In this article we will be looking at the use of play rugs and carpets as a method of creating safe, secure and entertaining play areas.